Rumour has it that the mysterious delay in the new Shepherd's Bush station on the West London Line opening is down to one of the platforms being built too narrow. I went down there to take a look, and it's obvious even from first glance that something's not right. 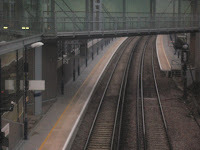 As the photos show (click to enlarge), there's barely enough space to walk round the lamp posts without crossing the yellow line, and apart from the area by the stairs the problem seems to exist along the entire length of the platform. The second photo shows the retaining wall that needs to be moved to fix the problem. Although not clear in the picture, there is at least a short area of tarmac between the metal fence and the concrete structure beyond, so it may be straightforward to fix. The right hand (southbound) platform appears to be a decent width. If you want to see this for yourself, turn left out of Shepherd's Bush tube station, cross in front of the bus station, and follow the pavement round to the left. As you descend the ramp towards the subway under the West Cross Route, you get a very clear view of the station to your left. Update: I've dug up a plan (4.7MB PDF) showing that the structure in the second photo is probably the Peninsular Building, and there's a wide road between it and the station. 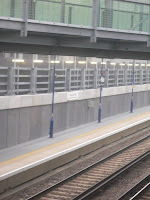 Worryingly, more than a year before construction began, it clearly shows a very narrow northbound platform (Here's a more detailed view from the same application). And here's the latest version of the interchange plans, dated June 2007, again showing plenty of space beyond the retaining wall. So does it mean that TfL are wrong when they say it'll open on 11th November with London Overground? There's an item about this on page 6 of the new edition of Private Eye (dated 12th October). Seems the platform is 18 inches shorter than required by the Railway Inspectorate. Seems it will cost £7 million to repair! You couldn't make it up! As John Rowland states on the uk.transport.london newsgroup, why not just remove the posts and attach the lamps to the top of the wall? That would cost a whole lot less than the £7m being touted to remove sections of the very large and very solid retaining "wall" behind the northbound platform. Thought you'd be interested in this. so does this mean that the station wont open until like next year spring ??? Will we be ready for 2012? It is now 2008, no work being done, and even the light standards are still in their original positions. I suppose this is what happens when we allow private companies to control what happens to our Dear Leader's plans for Metropolis. Crossrail fare rises: A stitch-up?